Fruit trees can last a long, long time. 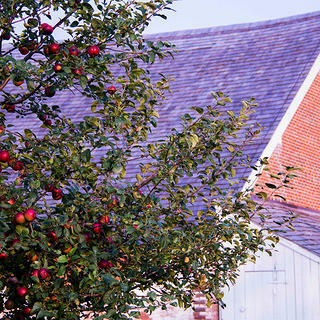 That’s one takeaway from the Fall 2017 issue of Preservation magazine, where we take you to historic orchards throughout Northern California, including Filoli (a National Trust Historic Site), Fort Ross State Historic Park, Guadalupe River Park & Gardens, and Jack London State Historic Park. There are historic orchards from coast to coast. Here are six you should check out. 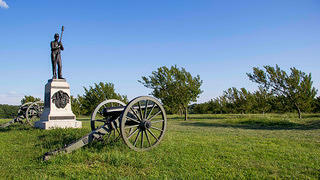 Gettysburg National Military Park in Pennsylvania has more than 50 orchards on site, and more than 3,000 fruit trees. The most famous of these orchards is the Peach Orchard (pictured above, with the Pennsylvania Independent Battery F Monument). 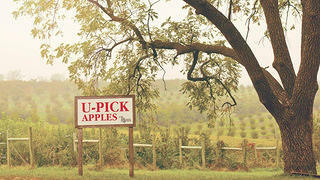 Located at the intersection of Emmitsburg Road and Wheatfield Road, this orchard was planted in 1858 by Rev. Joseph Sherfy, who established a nearby homestead. Five years later, on July 2, 1863, it was the site of an intense battle, when Gen. James Longstreet’s Confederate troops faced off against—and defeated—Gen. David E. Sickles’ Union troops. Back in 2008, National Park Service staff members replanted 72 peach trees at this orchard, with financial backing from the Gettysburg Foundation. This is just one of the many orchards the National Park Service has been working to restore and maintain at this historic site. And in experiencing these orchards, visitors get a more authentic look at what soldiers would have seen a century and a half ago. The pioneer community of Fruita was settled in south central Utah in 1880. The settlers planted extensive orchards, both as a cash crop and for subsistence, and maintained them until the last families left the area in 1969. 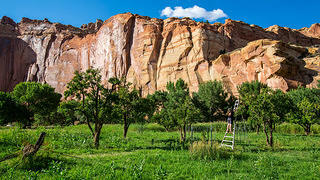 Now part of Capitol Reef National Park, the orchard has more than 3,000 trees, including apple, apricot, peach, plum, walnut, and almond trees. They’re all preserved and protected as part of the Fruita Rural Historic Landscape, and the National Park Service maintains them with historic cultural irrigation practices, pruning, mowing, pest management, and grafting. 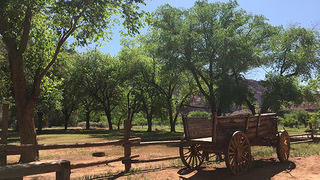 Visitors to the national park today can walk around any unlocked orchard, and fruit can even be picked—but only during designated times throughout the year. 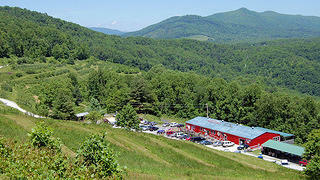 Along the Blue Ridge Parkway, above the North Toe River and the North Fork of the Catwaba, sits the Orchard at Altapass. In 1908, the Clinchfield Railroad opened a line through the area, rechristening a mountain pass known as the McKinney Gap as Altapass (or high pass). Soon after, the railroad opened a resort with two hotels and a golf course, and planted trees on several hundred acres of surrounding land. It wasn’t long before the trees were producing award-winning apples. At the height of its operations, the orchard was growing 125,000 bushels of apples a year and employing dozens of local families. Then in the 1930s, the Blue Ridge Parkway was constructed, splitting the orchard in half and threatening its future throughout the next several decades as developers began eyeing the land. In 1995, a woman named Katherine “Kit” Trubey learned of the threat to the orchard and purchased 280 acres around the parkway, selling the upper half to the Conservation Trust for North Carolina and establishing the nonprofit Altapass Foundation on the lower half. Together with Bill and Judy Carson, she protected the land and preserved it for future generations of visitors, who today come to the orchard to pick some of the 40-plus different varieties of apples, shop in the general store, eat at the Apple Core Grill, hike, attend live music and cultural events, and learn more about the region’s geography, culture, and history. Richard Kimmel, a World War I veteran and former banker, established Kimmel Orchard in 1925 near Nebraska City, Nebraska. Shortly after the orchard was up and running, he married painter Laurine Oetgen. For decades, the couple managed the orchard, with the firm belief that their land and their harvests belonged to their neighbors. Kimmel Orchard & Vineyard keeps that spirit alive today. It's dedicated to preserving its historic buildings, while also promoting agricultural education research through the Kimmel Education and Research Center, a partnership with the University of Nebraska-Lincoln. People flock to the orchard throughout the year to roam the 40 acres, where, depending on the season, they can pick more than 20 varieties of apples, as well as strawberries, peaches, blackberries, pears, and pumpkins. In 1874, Andrew W. Piper—a baker, city council member, political cartoonist, and mayoral candidate—moved to Seattle. After his business, the Puget Sound Candy Factory, was destroyed by the Seattle Fire of 1889, he purchased a large plot of land in the city and established a homestead. There, he and his wife, Minna, planted apple, pear, cherry, and chestnut trees. In the 1920s, the Pipers sold the land to the city of Seattle, which established Carkeek Park a few years later. 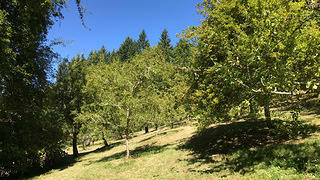 But the city’s maintenance budget was limited, and the orchard was left mostly untouched for decades. In 1983, the Seattle Department of Parks and Recreation’s Adopt-A-Park office encouraged volunteers to clear the forest overgrowth around the property. During this work, the volunteers discovered 29 surviving fruit trees. Most were apple trees, with varieties of apples that were available in 1890: Wealthy, King, Dutch Mignone, Red Astrachan, among others. A local landscape architect helped lead the restoration of Piper's Orchard. And today, a group called Friends of Piper’s Orchard, in coordination with the city and the Carkeek Park Advisory Committee, help maintain the orchard, which now has dozens of trees, including apple, pear, plum, and chestnut trees. There’s a festival at the park each September, where apples are picked and turned into cider, or baked into pies for a pie contest. Much of the other fruit harvested throughout the year is donated to local food banks. Glen Canyon National Recreation Area spans more than 1.25 million acres, from southern Utah to northern Arizona. Mormon pioneer Jacob Hamblin first came to the area in March of 1864, crossing the Paria River on a raft. A few years later, Mormon leader John D. Lee established a ferry crossing at the site, bringing other pioneers over to begin settling the land. The area became known as Lees Ferry. The pioneers established a homestead there, called Lonely Dell, where they built houses and a dam and irrigation system for farming. As tensions between the Mormons and the Navajo mounted in 1874, a defensive fort was built on the land. It was later turned into a trading post, a residence, a school, and a mess hall. The Lees Ferry Fort still stands at the Lees Ferry Historic District today, as does the orchard the pioneers started more than a century ago. In early 2017, more than 200 college students worked to revitalize the orchard as part of a service learning event—a partnership between the National Park Service and the U.S. Department of State’s Community College Initiative Program. The students pruned the healthy, surviving trees; replaced the trees that had died; and completed basic maintenance work on the irrigation systems, which continue to water the trees today.